I can’t believe it’s already the middle of October! But here it is, autumn is upon us. That time of soft melancholy and heartbreaking beauty. This is the time of Metal in the Chinese 5 element theory. A time for letting go of that which is no longer necessary and gathering energy within. Metal issues may be prevalent just now. For example, lung or sinus problems, dry skin or irritable bowels. Best essential oils for this season are those made from leaves and needles. Conifers, such as pine or spruce, disinfect the lungs, and environment and encourage clear breathing. Eucalyptus can help give a feeling of expansion as the days shorten and close in. It is also important to support the Heart at this time. The Fire element softens and warms Metal, so it doesn’t become too brittle or rigid. In behavioural terms, a rigid Metal type can become over controlling and stiff. Brittle Metal snaps at the slightest pressure or perceived insult. Petitgrain essential oil, made from the leaves of the bitter orange tree supports Fire and Metal, so is a good choice for offering now. One of the essential oils that is most symbolic of Metal for me is cypress (Cupressus Sempervirens). Even the sharp, pointy shape of the tree is metallic. So for these autumn days I give you….. 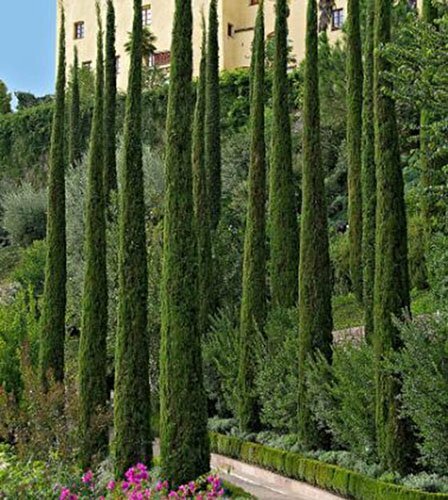 The evergreen cypress tree is picturesque and graceful with a tall, slender conical shape and dark green needles. Native to the eastern Mediterranean it grows wild throughout southern Europe and North Africa. It has been associated with cleansing and transformation (death and renewal) by various cultures, such as the Tibetans; it was dedicated to Pluto by the Greeks and planted in graveyards as a symbol of continuity. A Folklore legend says that the name Cypress comes from the Greek character Cyparissus, who could not find consolation after accidentally killing a favourite stag.He prayed to Apollo for permission to grieve forever, and Apollo turned him into a Cypress so that his place would always be where others grieve. Thus, the traditional association of Cypress trees with cemeteries, as an ancient symbol of comfort and solace and life after death. Extraction: Steam distillation from the needles and twigs. The oil is a pale yellow colour. Fragrance: fresh, sweet, coniferous, with a deeper resinous undernote. Terpenes: a-pinene, 8-3-carene, terpinolene, limonene, 8-cadinene. Actions: Anti-bacterial, antiinfectious, antispasmodic, anti-sudorific, antitussive, astringent, calming, deodorant, diuretic, hormone-like (ovarian problems), neurotonic, phlebotonic. Safety: Generally held to be non-toxic, non-irritant and non-sensitizing. Animals who are stuck in old behaviour patterns, especially if they sweat a lot or not at all. Those whose emotions have been de-stabilized by a lack of continuity, especially if it manifests as an extreme of behaviour, excessive or inappropriate urination or hormonal problems.